Welcome to DAY 1 of Inspired by Stamping May Release. I am so excited about this months new release. These new stamps are amazing and so fresh in so many ways. The first stamp set we are showcasing today is: Mason Summer Jar. This is one F-A-B-U-L-O-U-S stamp set. When I saw the sample set, I was so excited. It is complete with fruit elements, stems, leaves and a jar!! So being that the Strawberry Festival is just two weeks away and the streets are covered in advertising banners, this was a clear sign of what was going to be the focus of my card/creation. I found myself wanting to try something new and pulled out my little canvas bags. I stamped one strawberry on the bag and was pleased with the results, so continued with a few more. 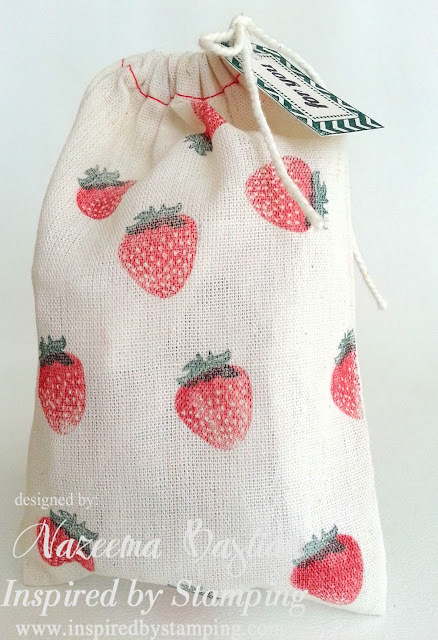 I was so excited and extremely happy with my little strawberry bags. The details of the strawberries were till clearly visible...YEAH!!! I also used a stamp tag from the Creative Tags stamp set, to create the tag on the bag. My card was created using another one of our new stamps being release this week as well. I stamped the strawberries with white dye ink on kraft cardstock. I then stamped over it again, with my red ink and just a bit off centered, so that the white would show more. Love the results. So there you have it, my examples showcasing Mason Summer Jar stamp set. 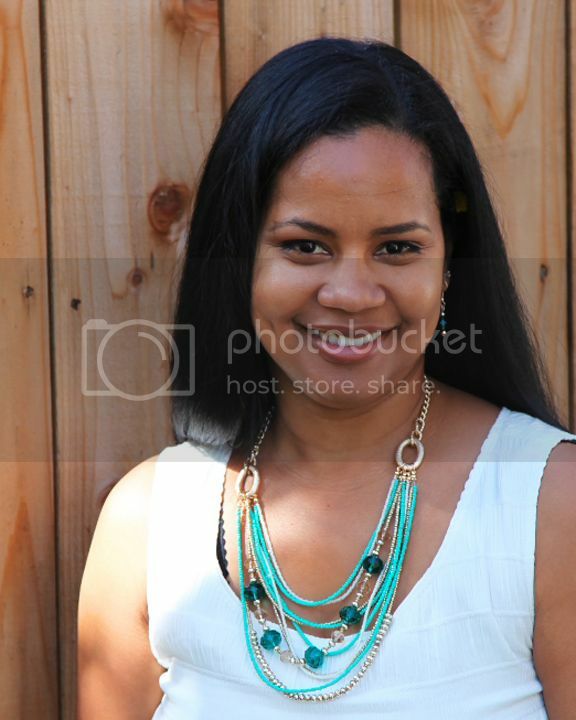 I hope you enjoyed my samples and will visit the rest of design team, to check out their amazing projects. May 6th-May 10th Inspired by Stamping will be giving away a $25 gift card to the store EVERY DAY on Joanna's Blog! Leave a comment to win. One comment per person per day. What an excellent idea, Nazeema!!! You did a great job! OMGosh, I love the stamped bag! Cute a cute project! Nazeema, this is AWESOME! Love that you used a little bag! How cute! Fabulous idea, I love making altered projects and this was is just so sweet. Love it. What a DARLING little bag! And the card is the perfect accompaniment. How clever to stamp with white ink first and then with red just a bit off center. Sure makes those seeds show up beautifully! SO cute!! 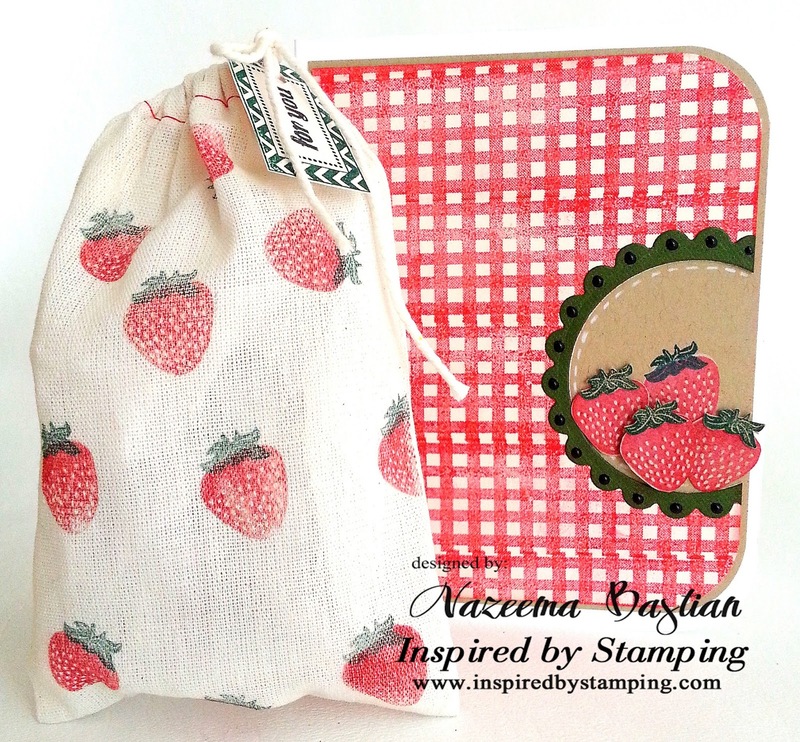 I love the strawberries on the sweet little bag and the matching card is just perfect! So I'm scrolling down, thinking how cute is that bag and then I see the matching card. WOW, I love it! 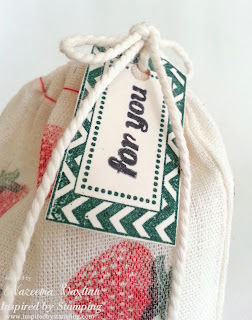 Love the strawberries stamped on the bag, fun idea! Great matching card! So cute what you did with the bag and the checkered background!! !